For newcomers to the Rolex world, picking the very first watch can be a daunting task but it doesn’t have to be. With a fantastic choice of entry-level Rolex watches at affordable prices, choosing that perfect timepiece, whether it be a simple, classic, or sporty one, should be a fun affair. We’ve delved into Rolex’s current catalog and present to you our top three recommendations for your first foray into the Rolex club. Rolex Datejust 116200 is a simple and classy entry-level watch. The Rolex Oyster Perpetual collection is the brand’s no-frills approach to a pristine luxury watch. Built with the essentials in mind, the Oyster Perpetual is the modern interpretation of a Rolex classic.The white dial of this particular Oyster Perpetual ref. 114200 is kept simple and clean with luminescent baton-style hour markers alongside the characteristic 3, 6, and 9 Arabic numerals. 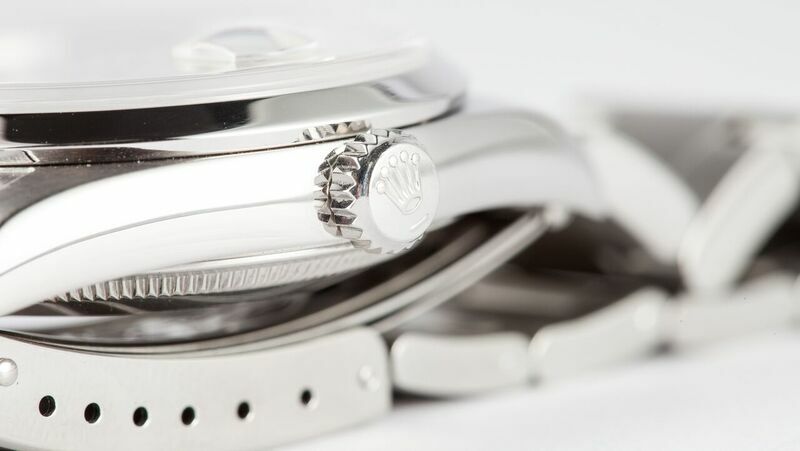 The 34mm stainless steel Oyster case is outfitted with the Twinlock screw-down crown to guarantee waterproofness to 330 feet (100 meters) and topped with a smooth domed bezel. The matching stainless steel Oyster bracelet with flat three-piece links is equipped with the Oysterclasp for a secure fit. 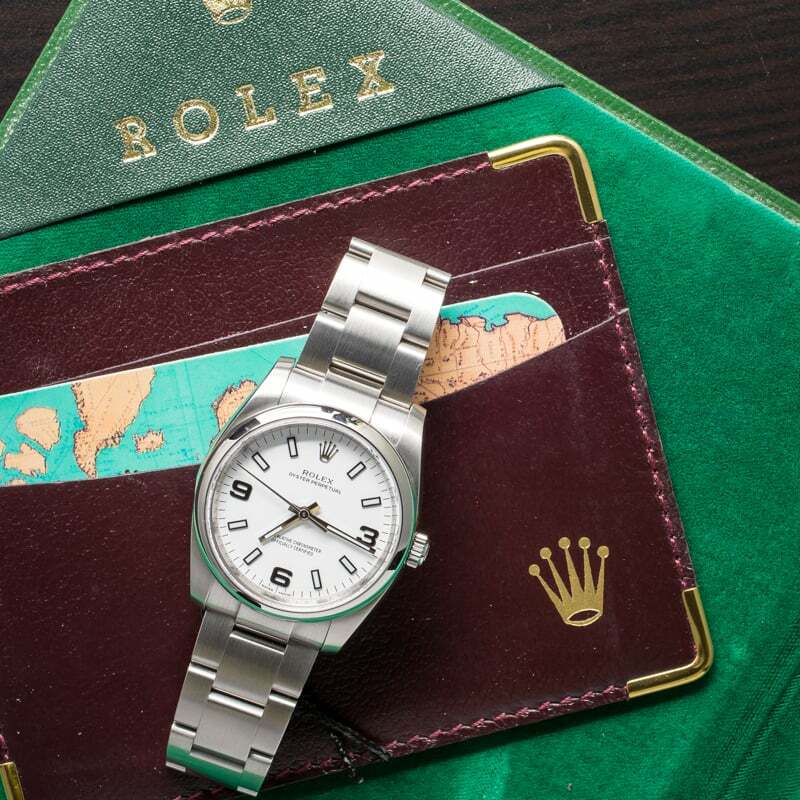 The Rolex Oyster Perpetual 114200 was built with the essentials in mind. Within the ref. 114200 is the Rolex Caliber 3130 automatic mechanical movement — the COSC certified and in-house tested caliber that offers 48 hours of power reserve and the precision and reliability we’ve come to expect from a Rolex watch. 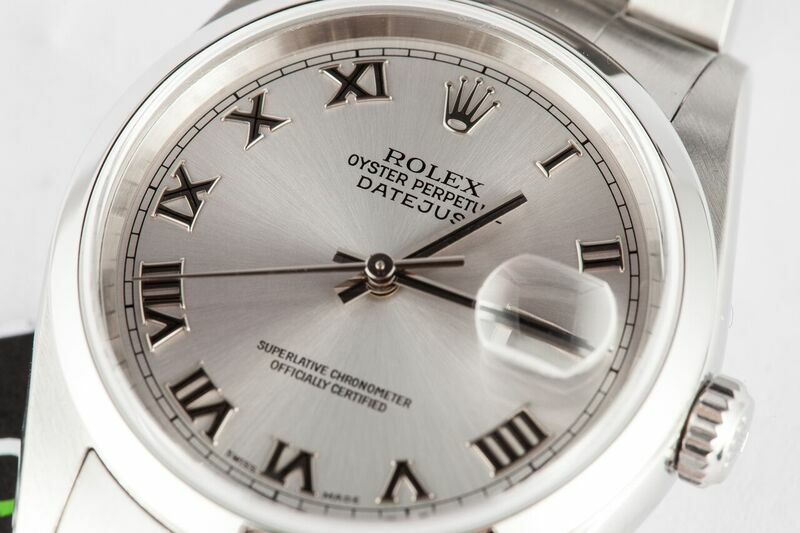 For a luxury watch that boasts a date function, there’s no better choice than a Rolex Datejust. The endless options within the brand’s huge Datejust collection include size, material, bezel, dial, and bracelet options to configure the ultimate watch according to one’s personal taste. For a luxury watch that boasts a date function, there’s no better choice than a Rolex Datejust 116200. For a timeless elegant dress watch, the Datejust 116200 checks off all the boxes. The stainless steel 36mm Oyster case and Oyster bracelet coupled with the smooth domed bezel provides a modern contrast to the more traditional Roman numeral dial. The color of the rhodium dial matches the stainless steel flawlessly for a sleek monochromatic aesthetic making the magnified date window at 3’clock all the more legible. The COSC certified Rolex Caliber 3135 perpetual mechanical movement offers an instantaneous date with rapid setting for added practicality. Waterproof to 330 feet (100 meters) the Datejust 116200 is an ideal everyday high-end watch. 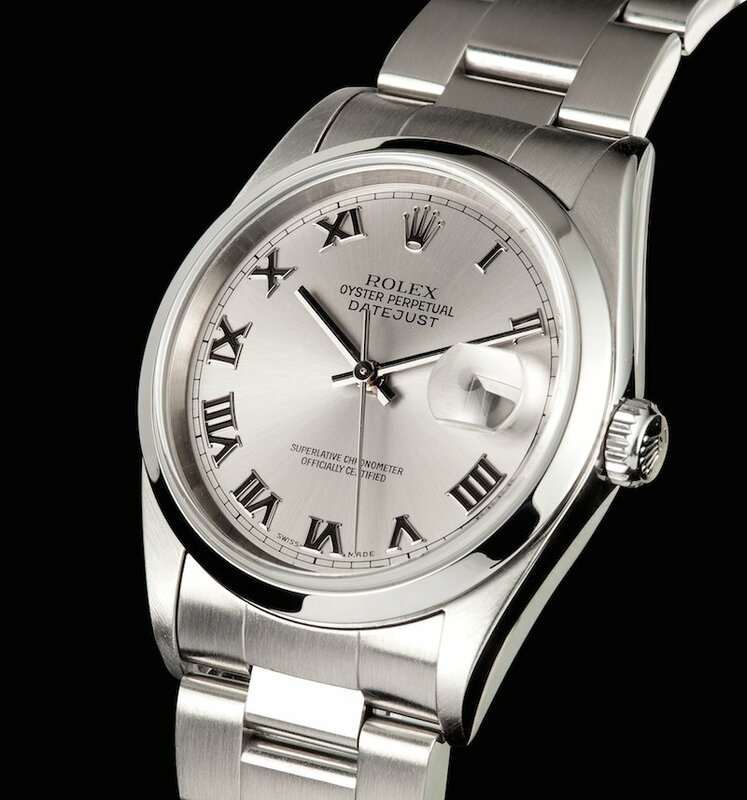 Rolex Datejust 116200 is COSC certified with a Rolex Caliber 3135 perpetual mechanical movement. For an entry-level Rolex sports watch, the Explorer is the best place to start. Robust thanks to its stainless steel body and sporty because of its black dial with prominent luminescent indexes and hands, the appeal of the Explorer lies it its straightforward attitude. 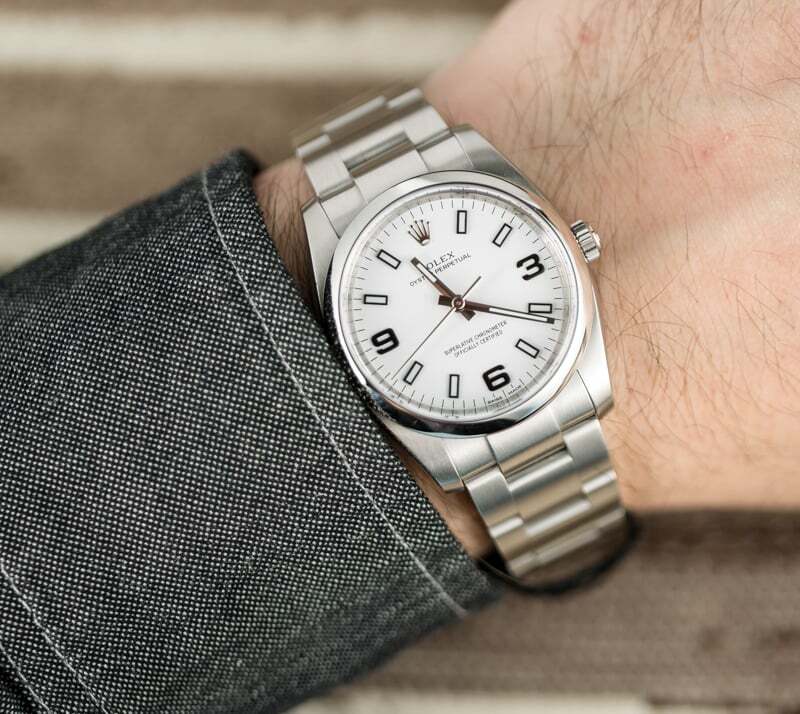 Rolex Explorer 214270 is simple, robust, and looks clean. 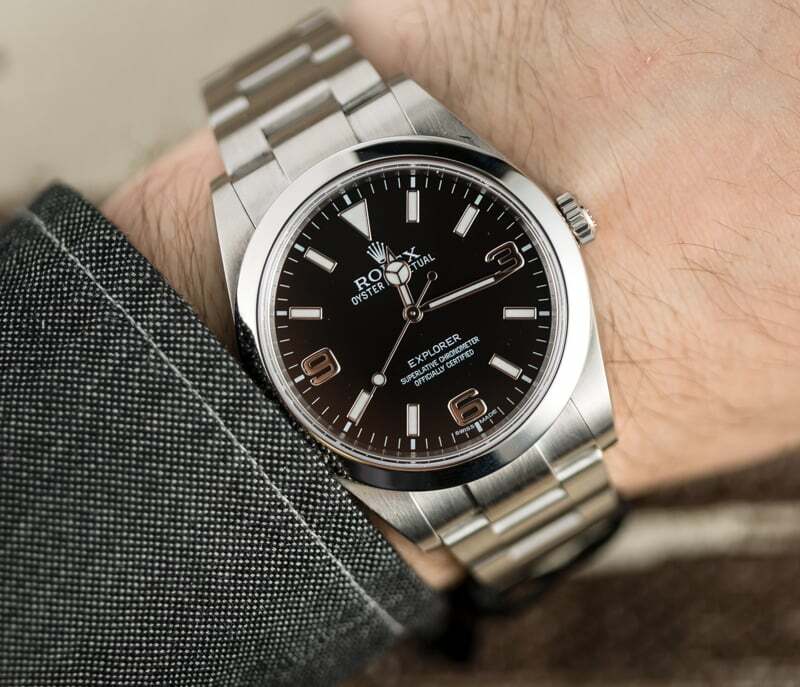 The Rolex Explorer ref. 214270 was first launched in 2010 and this year at Baselworld 2016 Rolex revamped the model (while keeping the same reference number) with some design tweaks. This particular Explorer 214270 dons a 39mm stainless steel case, smooth domed bezel, and a stainless steel Oyster bracelet. The Chromalight display allows the lume accents to emit a blue glow for up to eight hours while the Twinlock screw-down crown guarantees waterproofness down to 330 feet (100 meters). Ticking beneath the case is the dependable Rolex Caliber 3132 self-winding mechanical movement outfitted with Paraflex shock absorbers for increased resistance to external shocks. Now, choosing your perfect Rolex is a different story.